Lake George, New York, an oligotrophic lake. Trophic State Index (TSI) is a classification system designed to rate bodies of water based on the amount of biological activity they sustain. Although the term "trophic index" is commonly applied to lakes, any surface body of water may be indexed. eutrophic to hypereutrophic (TSI 60–100, having the highest amount of biological activity, "poor" water quality). The quantities of nitrogen, phosphorus, and other biologically useful nutrients are the primary determinants of a body of water's TSI. Nutrients such as nitrogen and phosphorus tend to be limiting resources in standing water bodies, so increased concentrations tend to result in increased plant growth, followed by corollary increases in subsequent trophic levels. [a] Consequently, a body of water's trophic index may sometimes be used to make a rough estimate of its biological condition. Carlson's index was proposed by Robert Carlson in his 1977 seminal paper, "A trophic state index for lakes". It is one of the more commonly used trophic indices and is the trophic index used by the United States Environmental Protection Agency. The trophic state is defined as the total weight of biomass in a given water body at the time of measurement. Because they are of public concern, the Carlson index uses the algal biomass as an objective classifier of a lake or other water body's trophic status. According to the US EPA, the Carlson Index should only be used with lakes that have relatively few rooted plants and non-algal turbidity sources. C is the concentration of particulate matter in units for milligrams per cubic meter. A lake is usually classified as being in one of three possible classes: oligotrophic, mesotrophic or eutrophic. Lakes with extreme trophic indices may also be considered hyperoligotrophic or hypereutrophic. The table below demonstrates how the index values translate into trophic classes. Oligotrophic lakes generally host very little or no aquatic vegetation and are relatively clear, while eutrophic lakes tend to host large quantities of organisms, including algal blooms. Each trophic class supports different types of fish and other organisms, as well. If the algal biomass in a lake or other water body reaches too high a concentration (say >80 TSI), massive fish die-offs may occur as decomposing biomass deoxygenates the water. An oligotrophic lake is a lake with low primary productivity, as a result of low nutrient content. These lakes have low algal production, and consequently, often have very clear waters, with high drinking-water quality. The bottom waters of such lakes typically have ample oxygen; thus, such lakes often support many fish species such as lake trout, which require cold, well-oxygenated waters. The oxygen content is likely to be higher in deep lakes, owing to their larger hypolimnetic volume. Ecologists use the term oligotrophic to distinguish unproductive lakes, characterised by nutrient deficiency, from productive, eutrophic lakes, with an ample or excessive nutrient supply. 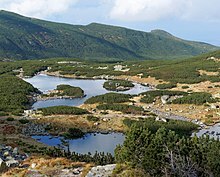 Oligotrophic lakes are most common in cold regions underlain by resistant igneous rocks (especially granitic bedrock). Mesotrophic lakes are lakes with an intermediate level of productivity. These lakes are commonly clear water lakes and ponds with beds of submerged aquatic plants and medium levels of nutrients. The term mesotrophic is also applied to terrestrial habitats. Mesotrophic soils have moderate nutrient levels. A eutrophic body of water, commonly a lake or pond, has high biological productivity. Due to excessive nutrients, especially nitrogen and phosphorus, these water bodies are able to support an abundance of aquatic plants. Usually, the water body will be dominated either by aquatic plants or algae. When aquatic plants dominate, the water tends to be clear. When algae dominate, the water tends to be darker. The algae engage in photosynthesis which supplies oxygen to the fish and biota which inhabit these waters. Occasionally, an excessive algal bloom will occur and can ultimately result in fish death, due to respiration by algae and bottom-living bacteria. 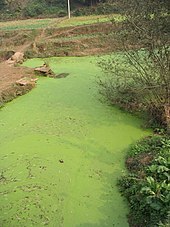 The process of eutrophication can occur naturally and by human impact on the environment. Eutrophic comes from the Greek eutrophos meaning "well-nourished", from eu meaning good and trephein meaning "to nourish". Hypereutrophic lakes are very nutrient-rich lakes characterized by frequent and severe nuisance algal blooms and low transparency. Hypereutrophic lakes have a visibility depth of less than 3 feet, they have greater than 40 micrograms/litre total chlorophyll and greater than 100 micrograms/litre phosphorus. The excessive algal blooms can also significantly reduce oxygen levels and prevent life from functioning at lower depths creating dead zones beneath the surface. Likewise, large algal blooms can cause biodilution to occur, which is a decrease in the concentration of a pollutant with an increase in trophic level. This is opposed to biomagnification and is due to a decreased concentration from increased algal uptake. Both natural and anthropogenic factors can influence a lake or other water body's trophic index. A water body situated in a nutrient-rich region with high net primary productivity may be naturally eutrophic. Nutrients carried into water bodies from non-point sources such as agricultural runoff, residential fertilisers, and sewage will all increase the algal biomass, and can easily cause an oligotrophic lake to become hypereutrophic. Often, the desired trophic index differs between stakeholders. Water-fowl enthusiasts (e.g. duck hunters) may want a lake to be eutrophic so that it will support a large population of waterfowl. Residents, though, may want the same lake to be oligotrophic, as this is more pleasant for swimming and boating. Natural resource agencies are generally responsible for reconciling these conflicting uses and determining what a water body's trophic index should be. ^ Note that this use of trophic levels refers to feeding dynamics, and has a much different meaning than a body of water's trophic index. ^ a b c University of Southern Florida Water Institute. "Trophic State Index (TSI)". Learn More About Trophic State Index (TSI) - Lake.WaterAtlas.org. University of Southern Florida. Retrieved 6 June 2018. ^ a b c United States Environmental Protection Agency (2007) Carlson's Trophic State Index. Aquatic Biodiversity. http://www.epa.gov/bioindicators/aquatic/carlson.html accessed 17 February 2008. ^ a b c Carlson, R.E. (1977) A trophic state index for lakes. Limnology and Oceanography. 22:2 361–369. ^ a b Carlson R.E. and J. Simpson (1996) A Coordinator's Guide to Volunteer Lake Monitoring Methods. North American Lake Management Society. 96 pp. ^ Definition of eutrophic at dictionary.com. This page was last edited on 6 February 2019, at 20:29 (UTC).